It is time for the second harvest, the wine harvest. In the past, the second crop was being prepared in these days. Thus, the harvest that began in Lammas was finished. 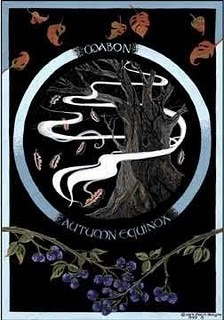 Druids honored the trees and the forest god by offering wine or cider libations. Again we gather the result of our efforts and liberate ourselves from the things that are no longer necessary and only hinder us in our path. We are supposed to do a work of introspection and balance ourselves. We might review unbalanced elements in our lives and inharmonious aspects of our personality, then try to fix them. 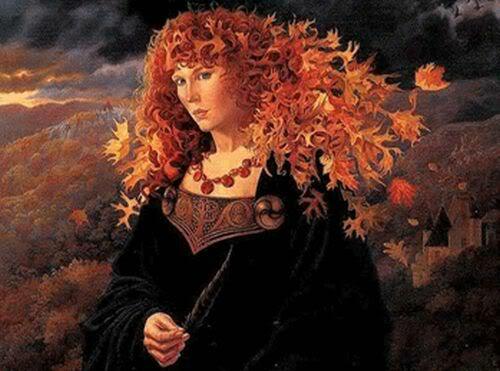 Mabon is a good chance to deal with our pending matters. 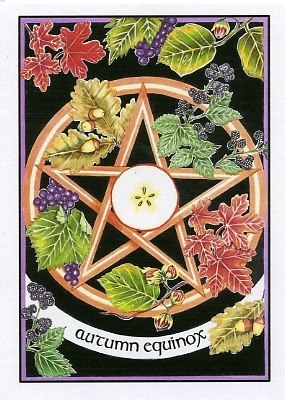 We prepare ourselves for the coldness of winter and the death of the God in Samhain. We try to create a cozy atmosphere in which to spend autumn and winter. The Mother Goddess grown old becomes the witch and weeps her fallen consort. The God loses his battle against darkness. This is the sacrificial moment in which we learn to let go of the things we love. What we abandon, will return to us in a different form. We decorate the altar with autumn leaves, pinecones, acorn, walnuts, etc. We braid ivy crowns and fill our horns to simbolize abundance. Traditionally, people painted their faces black and white. In Central Europe there were dances with wine, mead and fermented mare's milk. Priestesses ate Amanita muscaria, which allowed them to dance several days in a row. Before the ritual, we would walk through a park or forest to gather fry leaves. We'd put them in a basket and then on the altar. Day and night are balanced. Cold winds blow from the howling North. Oh blessed Goddess, I know life goes on. Just like life can't be without death. To the winter lands and the loving arms of the Goddess. I've sown and harvested the fruits of what I've done, good and evil. In the year that'll come, banishing misery and hate. Show me the secrets of wise living in this planet. Oh you who are lit up in the night! We meditate about aging, death and rebirth. We thank for what we've obtained and write down our wishes. We burn the paper with the candle. The candle can be of any color related to this Sabbat. Now we enjoy the feast. Afterwards, we bid farewell to the gods and to the elements. Incense: Cypress, sandal, pine, juniper, salvia. Stones: Amber, tiger's eye, cat's eye, yellow agate, citrine quartz. Items and symbols: Cornucopia, scales, ivy crown. Colors: red, orange, golden, brown, purple.